Embedding Matomo is easy. It works much like embedding a YouTube video. You just need to copy and paste a line of code into any context where you can use an iframe tag. Many blogs and most websites will let you do this. 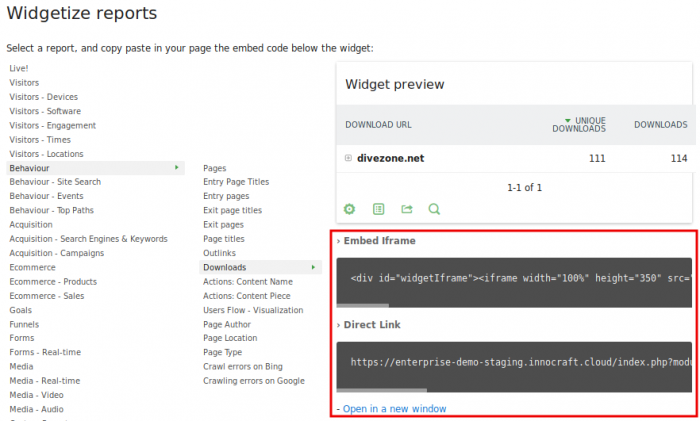 Let’s take a look at how you can embed Matomo (Piwik) in a WordPress website. WordPress is one of the most popular open source content management systems. The process is very similar whatever piece of software you are using. We recommend in this case that you create a new user and give it view access to the website you wish to embed in your password protected page. When you have chosen a widget to embed and copied its code, just go to the website in which you wish to insert it, and paste the code where you want it. In the below image, the top downloads report is inserted into a page of its own. As well as embedding single reports, you can also embed the full Matomo (Piwik) Dashboard. In Matomo, click on Administration in the top right corner, then “Platform > Widgets”. In this page you will find the link to embed the full dashboard. This can be very useful for users who wish to integrate Matomo inside another dashboard or app. You may also embed the full Matomo (Piwik) application within an Iframe. To make this work, a small change to the config file is required: see this FAQ. Once you have configured the INI setting to allow iframes, you can embed the full Matomo App directly in any HTML page in an iframe. It is also possible to include a PNG image (line graph, vertical bar graph or pie chart) that plots the data for any Matomo (Piwik) report. For more information, check out the documentation about Embedding Static Graph Images. All the raw user data in Matomo (Piwik), as well as all your report data, can be exported with our powerful Reporting APIs. By default all your analytics data is protected by Matomo (Piwik), and users must sign in with a valid account that has permission to view the data. In some cases (although rarely), you may want to make your analytics data publicly accessible. Learn more in this FAQ: How do I make Matomo report data public and viewable by anyone?.